We have seen here that the Gospels fit the genre of ancient biographies. With this classification comes certain expectations regarding truth-telling in their contents. But what about the idea that the Gospels are also (or overwhelmingly) works of "kerygma" - the preaching of the early church, faith-based documents with little or no basis in fact, that cannot be trusted for historical value precisely BECAUSE they are allegedly faith-based documents? Of course, there is no reason to say, if the Gospels are kerygmatic, then they cannot also be historical, or that their historical value is somehow lessened by their kerygmatic nature [More.ScCy, 140]. How well France has predicted that critics will take this short, yet totally illegitimate step. [Franc.EvJ, 101-2] There is simply nothing to prevent them fulfilling the roles of kerygma AND historical biography simultaneously. Indeed, Skeptics place an unfair burden on the Gospels with this determination: If what is written in the Gospels is true, then the Gospels could not help BUT be kerygmatic to some extent. This sort of argument thus erects a false dichotomy, one that, by this way of thinking, could not possibly be overcome. Not surpirisingly, it is usually the miraculous elements of the Gospels that are taken to be theologized history - the darkness at the crucifixion; the resurrection; the virgin birth - often coupled with the idea that such elements have been borrowed from pagan myth or practice. In the end it all boils down to our own point of view. Do we believe that miracles can occur, or don't we? What history should concern itself with is historical data, not metaphysics. If a report of an event cannot be explained within the ordinary system of historical cause and effect relations, and if we have other grounds for considering the report reliable, perhaps the issue of what exactly lies behind the data should simply be left open. But the integrity of the data should not be compromised simply because it suggests that our present worldview might be limited. The messianic age foretold by the prophets has arrived. The fulfillment of the messianic age is demonstrated by the life, death and resurrection of Jesus. By virtue of His resurrection, Jesus is the exalted Lord. The presence of the Holy Spirit in the church is a sign of God's presence with His people. Christ will return as Savior and Judge of the world. The call to repentance includes an offer of forgiveness from sins and the reception of the Holy Spirit as a guarantee of salvation. Patzia cites NT verses where each of these six kerygmatic pillars is preached - and they ALL come from either Acts or the Pauline epistles. NONE come from the Gospels! This in and of itself should make us question whether the Gospels truly serve as much of a kerygmatic purpose as some critics allege; but let us look at the idea more closely, as other authors see it. Jesus is the fulfillment of OT prophecies. The authority of Jesus is reflected in His ministry. His Passion proved that He was the Messiah. He was raised to the right hand of God. Pentecost was the gift of the Spirit. Forgiveness of sin is offered. That John is kerygmatic is beyond dispute - but this, again, does not equate with it not also reporting history. Witherington notes that the Synoptic Gospels, at least, "do not appear to be the kerygma or preaching of the early church itself, but rather to be the story about origins that stands behind early Christian preaching" as found in the book of Acts and in Paul's letters [With.JQ, 79]. That the Gospels were written by a group with a world-negating view, while ancient biographies were world-affirming. Other ancient biographies also served cultic purposes (ibid., 108). The point of the view of the Gospels is not world-negating at all (ibid., 127). Aune [Aune.NTLE, 24] asserts that the ministry of Jesus "is included in a kerygmatic setting" only in citations from Acts; missing from the Gospels, he notes, are the kerygmatic concepts of 1) Jesus' exaltation to the right hand of God; 2) His imminent return as Savior and Judge; and, 3) the appeal for repentance and faith. Now if the Gospels were in the main intended to be kerygmatic, these are some pretty important concepts to have left out. None of the Gospels (or any other New Testament book) can be considered a missionary tractate for evangelizing pagans. Before ca. AD 125, early Christian literature was written exclusively for Christian consumption. However, this should not impede recognition that the aggressive conversionist orientation of early Christians profoundly shaped their understanding of the mission and message of Jesus and imprinted itself indelibly on Gospel tradition. Thus, Aune sees the purpose of the Gospels as: 1) to reinforce personal and social implications of Christian belief (hence the emphasis on Jesus' teaching); 2) to persuade non-Christianmembers of Christian households of the ultimate religious significance of Jesus. Here again, it looks like direct kerygma takes a back seat to edification! And yet, the latter is precisely what many critics engage in. For example, it is asserted that Mark's use of the symbolic number 40, connected to, for example, the Israelites' wandering in the wilderness for forty years, Moses's forty-day communion with God, and David's rule of Israel that lasted for forty years indicate that Mark's story is allegorical and theological rather that historical. Critics may object, of course, that there is no proof that a conscious, symbolic choice was involved in the 40 days - but in fact, there is a strong indication of such a decision being made by Jesus in another place. E.P. Sanders has noted that Jesus probably consciously chose to create an inner circle of 12 disciples based on the symbolism associated with the 12 tribes of Israel [Sand.JesJud, 102]. If that is so, could not other conscious, symbolic choices have been made? Indeed as we note elsewhere, in His action of riding into Jerusalem on a donkey, Jesus was making an INTENTIONAL effort to fulfill prophecy. (Something we may add that it is implied Jesus did elsewhere - see John 19:28.) Other symbolic actions reflecting theological concepts might therefore be expected as part of the status quo. To use a modern example: If a report was given to us that a political activist had gone on a hunger strike for 14 hours to represent 14 of his fellow activists' imprisonment, would we dismiss the report as mythological because of the inherent symbolism? Of course not. A conscious choice was made to reflect something symbolic; and if the conscious choice of 40 days was NOT made by Jesus, then it WAS made by someone who wrote the Temptation story - and in that case, why should we ascribe any less determination and symbolic activity to Jesus than we would some scribe? ...presupposes the kerygmatic nature of the Gospels and feels really confident in asserting the historicity of the details only where their origin cannot be explained in terms of the life of the church. The life and preaching of the historical Jesus are available for us only in the post-Easter kerygma, and are so covered over by it that it is impossible to reconstruct out of it again a history of Jesus. The Synoptics are of course of the opinion that they are giving historical factual reports, although measured by our modern meaning of history they operate in a naively uncritical way. The Gospels...do not present the historical Jesus in distinction from the kerygma, but rather present a kerygmatized history of Jesus...(the disciples) intuitively explicat(ed) their memory until they found it in the kerygma, i.e., by 'kerygmatizing' their memory. By what logic does a concern to preach a message about a historical person exclude a concern to give an accurate account about of what he said and did?...Indeed it might be asked how much worthwhile history or biography has even been written by authors who did not have a deep personal motivation for writing, and a clear and often quite distinctive interpretation to offer of the events and persons they wrote about. Does anyone bother to write a biography of someone in whom they are personally uninterested? Now to be fair, we should ask whether the critics give us any solid basis for believing that the church created things for Jesus to say and do out of the whole cloth. As we have noted before, this is quite unlikely; but do the critics have anything to say in reply? Strangely, Robinson does admit that "the most obvious solution as to the relation of Jesus and the kerygma has always been that Jesus himself proclaimed the kerygma" [Robs.NQ, 100] - including Jesus' divine titles and resurrection - but then says that the historicity of such proclamations of Jesus have been "put indefinitely in suspension by our current methodology. For these are the sayings which could most obviously have arisen within the church as sayings of the heavenly Lord." I find this rather significant. It is NOT that any solid proof has been found of the early church or the Apostles creating material for Jesus to say; it is NOT that any pagan writer has accused the Christians of doing so, or that any alternate presentation of Jesus from within or shortly after His lifetime has been found. No, it is strictly "methodological considerations" (ibid., 104) that drive Robinson and his cohorts - NOT evidence, not revealed data, but PRESUMPTION. This being the case, it takes rather a lot for Robinson to assert that his methods have the greatest objectivity. How correctly has Boyd noted that for post-Bultmannians such as Robinson, "the burden has always been on the side of the Gospels" [Boyd.CSSG, 125] - and it is also not surprising to find that one of the Jesus Seminar's seven pillars of "scholarly wisdom" include an assumption that the Gospels are unreliable unless proven otherwise. Another point made is that the Gospels are in a genre referred to as "euangelion" (good news) - an ancient propaganda style. How truthful, it is asked, can this be? Again, the presupposition that because the Gospels were in a literary format of a sort used to promote propaganda automatically means that they, too, were propaganda (and therefore, by implication, not reporting the truth) is unwarranted - just as the fact that the same format of television commercial may be used to both sell detergent and discourage drug use does NOT mean that the latter is just a fact-bending sales pitch. It must be remembered that "good news" is nothing more than a genre-"envelope" (assuming it can honestly be called a genre at all in Roman culture). As such, the contents of that envelope could be anything from mythic elements to historical proclamation -- anything could be "good news." As a "carrier", the genre would NOT make a pronouncement about the nature of the contents. ". . . and since the Caesar through his appearance (epiphanein) has exceeded the hopes of all former good messages (euangelia), surpassing not only the benefactors who came before him, but also leaving no hope that anyone in the future would surpass him, and since for the world the birthday of the god was the beginning of his good messages . . ."
The argument here, however, misses a salient point. The Greek term euangelion, was actually "used as a technical term for the good news of political victory and private messages that brought joy to someone" [Patz.MNT, 58] - it was used for news of victory or for the utterance of an oracle [Heib.Int, 19]. This, again, does not require that the news reported was false or misleading - it was simply good. Nor is there any reason to assume copying - the common Skeptical argument of "A looks like B, so A must be a copy of B" is just as false as it sounds. Plutarch, Pomp. 66.3: "A number of people sailed for Lesbos, wishing to announce to Cornelia the good news (the eu-word) that the war was over." Heliodorus, Aeth 10.1.3 describes the mission of going to announce (eu) to those at Meroe the good news of victory. Thus, there is no necessary equation of euangelion with "mythical" or "untrue." At this point, with the background established, we may now provide a general, analogical reply, in modern terms, to the implication that because the gospels are in the format of kerygma and "propaganda," that they may not be taken as reliable history. Abraham Lincoln was born on February 12, 1809. He was born on a log-cabin farm on the south fork of Nolin Creek in Kentucky. His parents named him Abraham after his paternal grandfather. Lincoln could never remember much about his childhood. This excerpt reports the same facts as the previous one, but in the style of readable fiction - one that gives a "homey" and personified feel to the man that was Lincoln, so that we can see a picture of that "hardscrabble" farm, smell the wood of the log cabin, and experience Lincoln being "christened" in the name of his grandfather, in our own minds. This is standard practice for most modern biographies, especially those that care to do more than just sit on the bookstore shelves collecting dust; yet few would argue that because a modern biography is written in the form of a narrative, or in the same way that a historical novel is written, it is therefore unreliable! That must be determined by examination of the claims within the biography, according to the evidence - not by the genre and format of the biography! Genre is only one of many tools for transmission. A responsible student of literature will also consider style, vocabulary, form, and purpose - as an English professor like Helms should definitely have known - and beyond that, again, are questions of historical confirmation that critics like Helms completely ignore. So what is the best way to look at the Gospels - as history or theology? 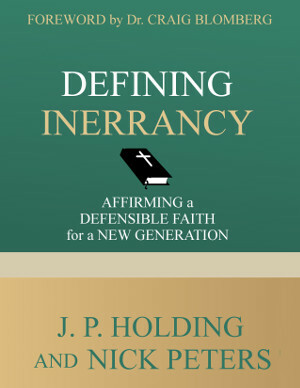 Actually, as we have already said, the answer is both, for as Dunn writes, the bulk of NT scholarship points towards the idea that in the Gospels, "interpretation builds upon the historical information,"[Dunn.EvJ, 1]. As with the Lincoln cite above, there are facts mixed with interpretation; and the interpretation is based on facts. It is the job of the scholar to help us know the difference, and the job of the student to find out. Aune.NTLE Aune, David. The New Testament and Its Literary Environment. Philadelphia: Westminster, 1987. Boyd.CSSG Boyd, Gregory A. Cynic Sage or Son of God? Chicago: Bridgepoint, 1995. Davi.Int Davies, W. D. Invitation to the New Testament. New York: Doubleday, 1966. Dunn.EvJ Dunn, James D. G. The Evidence for Jesus. Louisville: Westminster, 1985. Dunn.UDNT Dunn, James D. G. Unity and Diversity in the New Testament. Philadelphia: Westminster, 1977. Franc.EvJ France, R. T. The Evidence for Jesus. Downers Grove: IVP, 1986. Heib.Int Heibert, D. Edmond. An Introduction to the New Testament. Chicago: Moody Press, 1975. Helm.GosF Helms, Randel. Gospel Fictions. Buffalo: Prometheus Books, 1988. .ScCy Moreland, J. P. Scaling the Secular City. Grand Rapids: Baker, 1987. .BNT Moule, C.F.D. The Birth of the New Testament. Cambridge: Harper and Row, 1982. MalNon Oates, Stephen B. With Malice Toward None. New York: New American Library, 1977. Patz.MNT Patzia, Arthur G. The Making of the New Testament. Downers Gove: IVP, 1995. Robs.NQ Robinson, James M. A New Quest of the Historical Jesus. Philadelphia: Fortress, 1959. Sand.JesJud Sanders, E.P. Jesus and Judaism. Philadelphia: Fortress, 1985. Talb.WIG Talbert, Charles H. What Is A Gospel? Philadelphia: Fortress, 1977. With.JQ Witherington, Ben. The Jesus Quest. Downers Grove: IVP, 1995. Youn.JesJT Young, Brad H. Jesus the Jewish Theologian. Peabody: Hendrickson, 1995.